This is a display of girl toys at Target. Welcome to your life, girls. Cell phone – got it. Mop and gloves – of course! Now get out there and clean the house and look pretty doing it! You’re not doing anything else, are you? Oh, hush, honey. Leave the talking to the men. Put on them high heels and get in there and rattle those pots and pans! I am going to hunt down the Target buyer and have a chat. So much pink, it makes me gag. ALL OF THE GIRL TOYS ARE ALL PINK PINK PINK. Ok, with small splashes of purple and yellow and green, but 98% pink. It is bizarre. You forgot the ballerina and (likely) princess crap on either side. Because after all that cleaning you’re gonna want to go dance your pretty pink self into the arms of a prince. I’m surprised the stripper poles aren’t right there. “My Little Stripper” – so cute! You gals are so sensitive. Finally–one stop shopping for “Pimps and HOs” night at the preschool! Pimps is on Aisle 7. Gotta keep the boys and girls separate or there might be gender confusion. I weep for my daughter’s future. I am also distressed that many little girls’ ballet classes these days (yes, I have looked into such things even though Felicity is merely (almost) one) are called something like “Princess Parade” and involve tiaras and feather boas and hot pink EVERYWHERE. Because…being little ballerinas is not GIRLY ENOUGH on its OWN? ARGH. Step 2: Go to the boys’ aisle and show the red and blue cars and orange Home Depot tool kits. Boys will be useful. Boys will go places. Thank god we can be princesses and have a prince save us. I gave up shopping at Target when they supported an anti-gay candidate. Thanks for reinforcing that decision. I don’t think this is a Target problem as much as a genderization problem in our society. My store also has (toy) vacuum cleaners and shopping carts on the same aisle. It makes me really annoyed that EVERYTHING in that store is labeled either boy or girl, be it toys, dinnerware, clothing, or other things that gender (especially for little kids) makes no difference on. I’ve learned that girls can’t like robots or space or wear camo pants. Boys however, do not like anything nature-y – animals, flowers, the sky, etc. It’s everything everywhere, and it starts right from birth. LOL That is BOY Twin’s FAVORITE aisle! I like that it can be boy twin’s favorite aisle. Boy twin has a cool family. Astronaut? No, honey, that’s for boys. Doctor? Ditto. Congress*man*? Ditto. Scientist? Ditto. Stripper? Yep. Teacher? Fine. Secretary? Sure. Nurse? OK, but never Doctor. This is a very ugly repeat of the 1950’s – how is this happening? Shame on you Target, shame on you. I think they need a dose of this: http://www.pinkstinks.co.uk/ … well worth a look. And then it was heartbreaking for me to see little boys being told they couldn’t like pretty, fun, soft things because they are too girly. Gah. I think this has far more to do with the attitude of the parents than the color of the aisle–every big store has the same setup. I have never seen the pink aisle as anything other than a pretty color. The items in the aisle are only limiting if you decide they are. If you want to indulge your inner pink, then do so, but I never told my daughter that those things were “it” for her. I’ve never believed it, and neither does she. Here’s the case at my house. My daughter is 18, and she loves the pink aisle–always has. In real life she rides horses professionally for our horse training business. Her dream vehicle is a Chevy 3500 pickup with the big tow package. She knows more about trucks than most men I know. She isn’t afraid of hard work, long hours, sweat, dirt, 1200 pounds of fast horse, or jumps that are 5 feet tall. I couldn’t tell you the last time she wore a dress or put on makeup. So I think it’s possible to love pink and still be whatever you want to be, regardless of what society thinks about it. It’s not about the pink, though I do find it annoying that the girl toy aisle is SO pink. It’s more about the arrangement of high heels, cell phone, boa and a MOP. So it’s obviously not just a clothing display. It is…something. 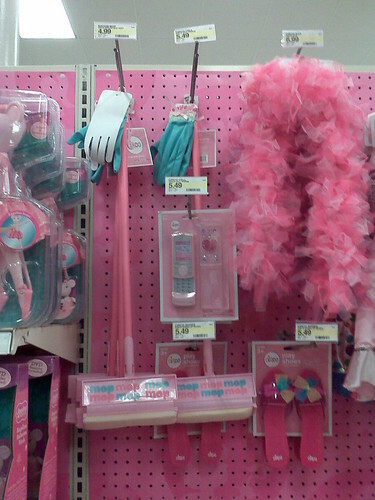 I was in a drugstore the other day, where I saw hot pink “glamour” rubber gloves with a fake pearl trim– for grown-ups! Do I need to look glamorous while unplugging the toilet? Does that boa come in black? Cause the pink clashes with mah heels. And saucepans.